Be sure to check out the large images at flickr for insane amounts of detail in these shots. In some places- every stitch on a baseball. I am given to moods, melancholy, and suffer from an abundance of hubris– due to a series of ego related karmic retributions. All ‘effed up, there are days- often sunny ones- when I wake from that dark and torturous dreamland inflicted on me since my wastrel youth– in one of my little moods. The US National Library of Medicine notes that “some people experience a serious mood change when the seasons change. They may sleep too much, have little energy, and crave sweets and starchy foods. They may also feel depressed. Though symptoms can be severe, they usually clear up.” The condition in the summer is often referred to as Reverse Seasonal Affective Disorder, and can also include heightened anxiety. The name “melancholia” comes from the old medical theory of the four humours: disease or ailment being caused by an imbalance in one or other of the four basic bodily fluids, or humours. Personality types were similarly determined by the dominant humour in a particular person. Melancholia was caused by an excess of black bile; hence the name, which means ‘black bile’ (Ancient Greek μέλας, melas, “black”, + χολή, kholé, “bile”); a person whose constitution tended to have a preponderance of black bile had a melancholic disposition. See also: sanguine, phlegmatic, choleric. Melancholia was described as a distinct disease with particular mental and physical symptoms in the fifth and fourth centuries BC. Hippocrates, in his Aphorisms, characterized all “fears and despondencies, if they last a long time” as being symptomatic of melancholia. In the medieval Arab world, the Arab psychologist Ishaq ibn Imran (d. 908), known as “Isaac” in the West, wrote an essay entitled Maqala fi-l-Malikhuliya, in which discovered a type of melancholia: the “cerebral type” or “phrenitis”. He carried out a diagnosis on this mental disorder, describing its varied symptoms. The main clinical features he identified were sudden movement, foolish acts, fear, delusions and hallucinations. In Arabic, he referred to this mood disorder as “malikhuliya”, which Constantine the African translated into Latin as “melancolia”, from which the English term “melancholia” is derived. Warm and humid patches of air had permeated the greater New York area for several days, producing the frequent rain and gray fogs which had made the Autumn of 2008 remarkable. 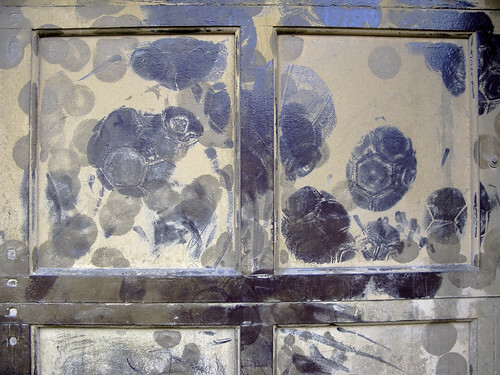 After a severe squall, whose high winds and driving rains obliterated those clouds occluding the Hunter’s Moon during the previous week, and an unusually warm late summer and autumn- a phenomena once referred to as “Indian Summer“- the entirety of the area found itself coated in a grimy patina of storm blown mud and filth- like the garage door which is the photographic subject above and below. There was blown grit on the sidewalk, with wind action the presumed culprit, as the storm picked its pathway through the rain puddles which collect in and garland the broken pavement of the Newtown Pentacle. Anxiety about being in places or situations from which escape might be difficult (or embarrassing) or in which help may not be available in the event of having an unexpected or situationally predisposed Panic Attack or panic-like symptoms. Agoraphobic fears typically involved characteristic clusters of situations that include being outside the home alone; being in a crowd or standing in a line; being on a bridge; and traveling in a bus, train or automobile. The situations are avoided (e.g., travel is restricted) or else are endured with marked distress or anxiety about having a Panic Attack or panic-like symptoms, or require the presence of a companion. 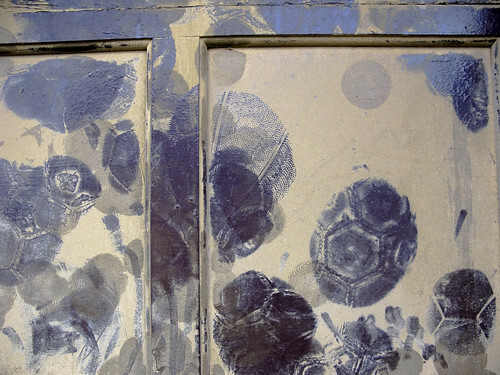 The anxiety or phobic avoidance is not better accounted for by another mental disorder, such as social phobia (e.g., avoidance limited to social situations because of fear of embarrassment), specific phobia (e.g., avoidance limited to single situation like elevators), Obsessive-Compulsive Disorder (e.g., avoidance of dirt in someone with an obsession about contamination), Post-traumatic stress disorder (e.g., avoidance of stimuli associated with a severe stressor), or Separation anxiety disorder (e.g., avoidance of leaving home or relatives). The authorities at several meteorological centers warned that the arrival of winter was but a few days off, and we citizens of the megalopolis should make the best of this pleasant weather while it lasted. Just 72 hours later, the temperature would plummet to a hard freeze, and the bone cracking devastation of a metropolitan winter began in earnest. A beautiful day, I headed for joy defined hinterlands of the Newtown Creek. 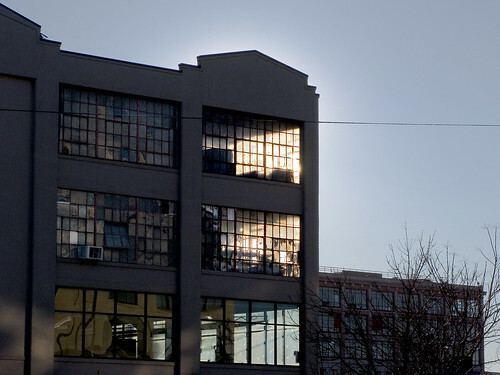 Following the sun to Long Island City that Saturday, I crossed the neighborhood of Dutch Kills. Geographically distinct from the tributary of the Newtown Creek for which it is named, Dutch Kills is a mixed use neighborhood which is a dichotmous mix of lovely 19th and early 20th century homes, apartment houses, and churches with heavy industry sited incongruously nearby. Crescent St., which has carried traffic from modern day Queens Plaza to the wildly distant Bowery Bay- located on the distant northern shore of elysian Astoria- since the time of the Dutch- is where I found this enigmatic garage door. It is odd that I am so fascinated by the world of a century ago, for were a creature of my inner weakness and faults were to appear in amongst the super predators that inhabited that Newtown, I would have quickly been sent off to a nearby madhouse. In 1887, Nellie Bly– the unofficial inspiration for Lois Lane– faked madness for the sake of investigating the Women’s Lunatic Asylum on Blackwell’s Island. Click here for a link to an absolutely free audiobook of Nellie Bly’s Ten Days in a Madhouse, from Librivox. I must confess to one of the morbid habits which consumes me, and why I can always be found amongst the lightning crashed trees and storm tossed alleys of Newtown Creek soon after (or sometimes during) a weather event. Out of mercy for the sensibilities of those whose childhood was not spent only in the company of dusty shelves, and they whose actions are not governed by an aesthete’s desire to witness the bizarre and macabre truths of life and death, for the sake of these innocents- I do not show these forbidden photos to anyone. Even the long suffering and effusive Lady of The Pentacle is denied access to these images of broken and shattered life- which I collect after a cleansing storm washes through the Newtown Pentacle. Detailed, and sharply focused, the bloody patches of cement and the little piles of flystruck meat are the center of a great ecosystem that somehow survives the moonscape hostility of Long Island City. These swollen and torn animals, which present themselves first via olfactory means- to me- are proof of life’s resiliency and provide great hope in their fecund example. You will never see these images. Satisfy yourself instead with the amusing spectacle of these imprinted sporting goods, tattoo imprints of the actions of adolescent spirit. When advised by medical practitioners that I should run, I admonish them. I am from Brooklyn, and without someone or indeed- something- chasing me, I walk at my own pace. Thus, I am fascinated by the NYC marathon, which crosses the ancient heart of the Newtown Pentacle on its course. All of the coverage you see of this event is usually manhattan centric, but it actually rolls through some interesting places. The Pulaski Bridge is the 13.1 mile point in the New York Marathon, for which it is closed to vehicular traffic annually. Runners exit Greenpoint, speed over the Newtown Creek, and head for the Queensboro bridge. They spend 2.5 miles in Queens. The New York City Marathon (ING New York City Marathon for sponsorship reasons) is a major annual marathon (42.195 km (26.219 mi) whose course runs through all five boroughs of New York City. 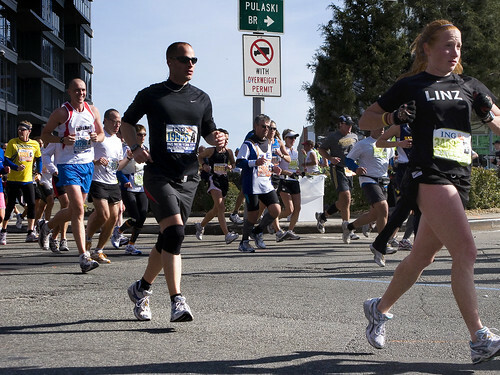 It is one of the largest marathons in the world, with 37,850 finishers in 2006. Along with the Boston Marathon and Chicago Marathon, it is among the pre-eminent long-distance annual running events in the United States and is one of the World Marathon Majors. When they hit Queensboro, relief for the 2.5 miles of pain that the runners remember as Long Island CIty becomes intellectually closer, and most of the runners redouble their determination and effort. There is a significant Police Dept. muster, in DUQBO, including auxiliary and cadet officers. The cops are involved, from their point of view, in a 25 mile long rerouting of vehicular and pedestrian traffic across multiple municipal and jurisdictional districts. Rerouting the millions of vehicles denied easy access to Manhattan, ensuring that FDNY can move ambulance and fire units seamlessly around the event, mustering and deploying the hundreds of traffic officers- as well as dozens of specialized units ranging from Equestrian to Aviation… This is no marathon, this is a military operation. Come to think of, so was the story which inspired all future marathons, and lent them its name- in Greece. The Battle of Marathon (Greek: Μάχη τοῡ Μαραθῶνος, Māche tou Marathōnos) took place in 490 BC during the first Persian invasion of Greece. It was fought between the citizens of Athens, aided by Plataea, and a Persian force commanded by Datis and Artaphernes. It was the culmination of the first attempt by Persia, under King Darius I, to subjugate Greece. The first Persian invasion was a response to Greek involvement in the Ionian Revolt, when Athens and Eretria had sent a force to support the cities of Ionia in their attempt to overthrow Persian rule. The Athenians and Eretrians had succeeded in capturing and burning Sardis, but was then forced to retreat with heavy losses. In response to this raid, the Persian king Darius I swore to have revenge on Athens and Eretria. Once the Ionian revolt was finally crushed by the Persian victory at the Battle of Lade, Darius began to plan to subjugate Greece. In 490 BC, he sent a naval task force under Datis and Artaphernes across the Aegean, to subjugate the Cyclades, and then to make punitive attacks on Athens and Eretria. Reaching Euboea in mid-summer after a successful campaign in the Aegean, the Persians proceeded to besiege and capture Eretria. The Persian force then sailed for Attica, landing in the bay near the town of Marathon. The Athenians, joined by a small force from Plataea, marched to Marathon, and succeeded in blocking the two exits from the plain of Marathon. Stalemate ensued for five days, before the Athenians (for reasons that are not completely clear) decided to attack the Persians. Despite the numerical advantage of the Persians, the hoplites proved devastatingly effective against the more lightly armed Persian infantry, routing the wings before turning in on the centre of the Persian line. The defeat at Marathon marked the end of the first Persian invasion of Greece, and the Persian force retreated to Asia. Darius then began raising a huge new army with which he meant to completely subjugate Greece; however, in 486 BC, his Egyptian subjects revolted, indefinitely postponing any Greek expedition. After Darius died, his son Xerxes I re-started the preparations for a second invasion of Greece, which finally began in 480 BC. And, yeah, I know- the “in greece” link is the Battle of Thermopylae, and is highly stylized. The interesting part of the marathon, to my eye, is what’s happening around it. Queens Plaza devoid of vehicular traffic, for instance. But NYC has been making great effort and spending big money on Physical Education and Culture since the early days of Progressivism. Volunteers and well wishers, of both corporate and individual stripe, line the streets. This is actually a dangerous place to be, as at any moment, 200 pounds of human meat may accidentally run into you. 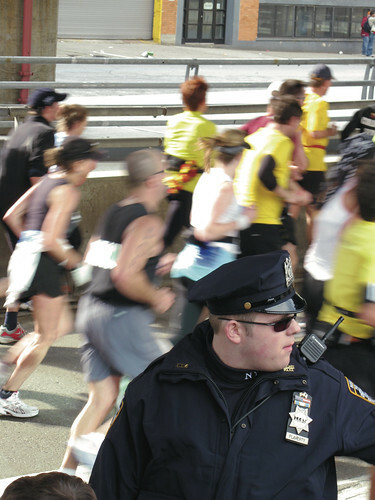 Accordingly, NYPD aggressively enforces a margin of safety between runners and crowd, as is their stated mandate and mission- protect and serve. The physical culture movement of the 1800s owed its origins to several cultural trends. As a result of the Industrial Revolution, there arose a perception that members of the middle classes were suffering from various “diseases of affluence” that were partially attributed to their increasingly sedentary lifestyles. In consequence, numerous exercise systems were developed, typically drawing from a range of traditional folk games, dances and sports, military training and medical calisthenics. Many of these systems drew inspiration from the classical Greek and Roman models of athletic training and were organized according to more-or-less scientific methods. Increasing levels of literacy, the increasing democratization of printing and the relative affluence of the middle classes spurred the growth of a genre of magazines and books detailing these systems of physical culture. Mass production techniques also allowed the manufacture and commercial sale of various items of exercise equipment. During the early and mid-1800s, these printed works and items of apparatus generally addressed exercise as a form of remedial physical therapy. Certain items of equipment and types of exercise were common to several different physical culture systems, including exercises with Indian clubs, medicine balls, wooden or iron wands and dumbbells. 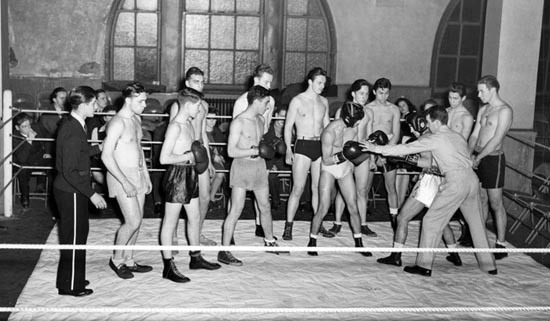 Combat sports such as fencing, boxing and wrestling were also widely practiced in physical culture schools, and were touted as forms of physical culture in their own right. By the later 19th century, the ethos of physical culture had expanded to include exercise as recreation, education, as preparation for competitive sport and as an adjunct to various political, social, moral and religious causes. The Muscular Christianity movement is an example of the latter approach, advocating a fusion of energetic Christian activism and rigorous physical culture training. A neverending stream of humanity, emblazoned with signage and logotypes, course past. Many are in the final stage of enacting some personal and tragic journey, or running to memorialize the name of a lost loved one, or to celebrate some event. Many have charitable contributions tied to the miles and miles of pavement they cross. 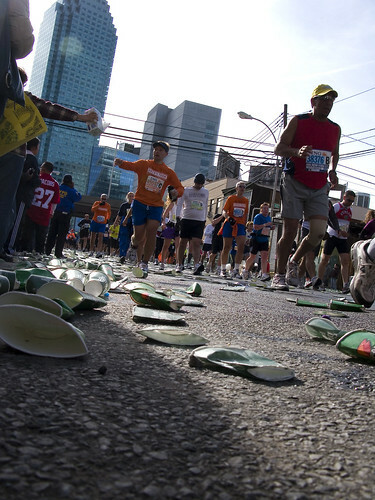 Most just run for the human challenge presented by the concrete realities of New York City. At least that’s what the messages were in a series of Nike and Footlocker ads that I worked on for a major metropolitan ad agency just a few years ago. Like I said at the beginning of this post, I walk (scuttle, actually). These people are nuts. The terms to jog and jogging as referring to a form of exercise, originated in England in the mid seventeenth century. This usage became common throughout the British Empire and in his 1884 novel My Run Home the Australian author Rolf Boldrewood wrote “your bedroom curtains were still drawn as I passed on my morning jog”. In the United States jogging was also called “roadwork” when athletes in training, such as boxers, customarily ran several miles each day as part of their conditioning. In New Zealand during the 1960s or 1970s the word “roadwork” was mostly supplanted by the word “jogging”, promoted by coach Arthur Lydiard, who is crediting with popularizing jogging. The idea of jogging as an organised activity was mooted in a sports page article in the New Zealand Herald in February 1962, which told of a group of former athletes and fitness enthusiasts who would meet once a week to run for “fitness and sociability”. As they progress, cheering crowds villify the thought of surrender, admonish fatigue, and buoy the athletes to further exertion. 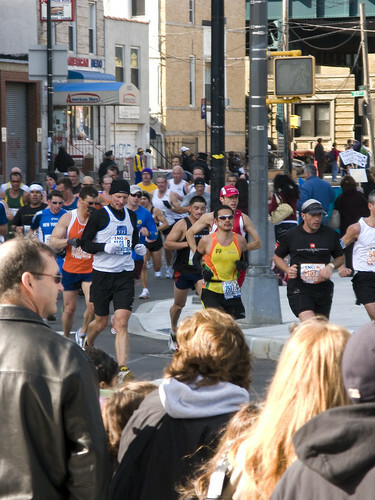 Around the world, the word “marathon” evokes images of New York City. Before the New York race began, marathons were modest events run by a few athletes and followed by a few fans interested in the limits of human endurance. New York Road Runners and marathon co-founder Fred Lebow changed that. 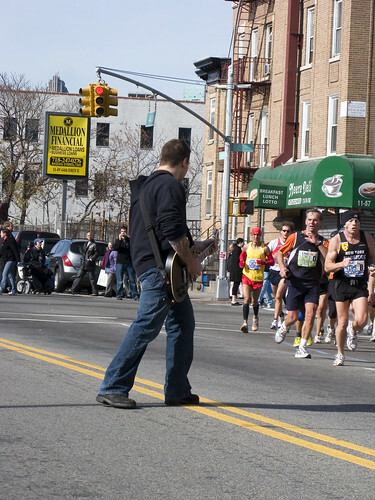 Today many marathons are huge media events that take over entire cities around the globe. 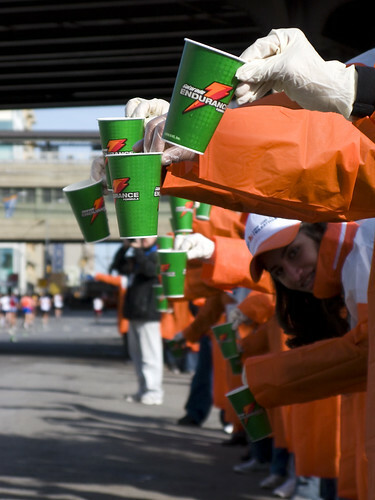 None is as prominent as the ING New York City Marathon, but all city marathons are modeled on it. 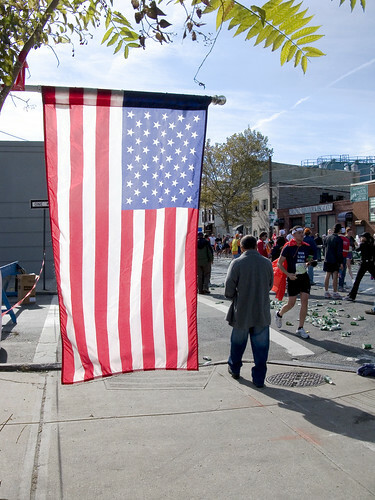 Modern marathoning owes its start — and its world-class status — to New York. All along the route, bands were assembled and were allowed to play both amplified music and drums- normally a violation of the city’s strictly enforced Cabaret Law. Entertainers, street performers, and representatives of the local Ethnic Societies all had their spots staked out early. More than 100 live bands stationed at regular intervals along the course will motivate and entertain participants and spectators alike. A special stage at Columbus Circle sponsored by Continental Airlines will provide inspiration for the final .2 mile, and there will be live entertainment at the finish line as well. Long Island City’s longtime residents always seem to have a good natured chuckle when one of these “City” events rolls through. 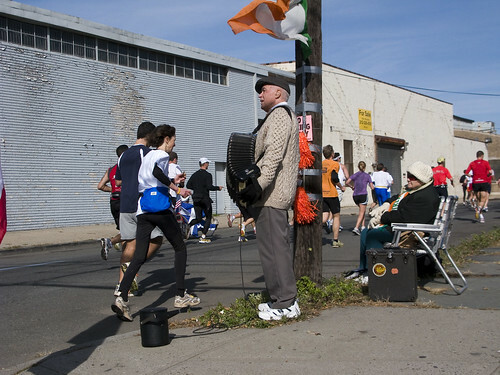 This gentleman and his wife set up chairs, and he was playing the “toura loura loura” brand of music on his accordion to the runners. He also played an instrumental version of “eleanor rigby“, which was both ironic and funny. and British Paula Radcliffe won the female prize for her 2 hour, 23 minute, and 56 second run. 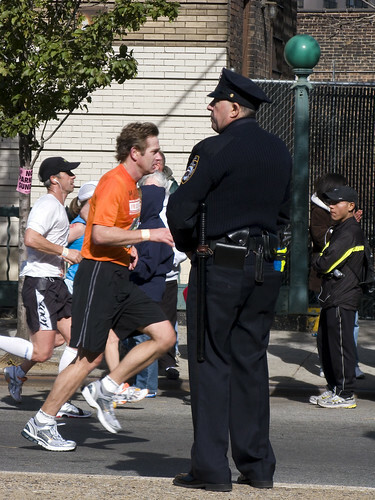 In 2008, the New York City Marathon was only thought to have killed two. Reports were later revised to three. Carlos Jose Gomes, 58, of Brazil fell unconscious shortly after completing the race in 4:12:15. An autopsy revealed that he had a pre-existing heart condition and died of a heart attack. 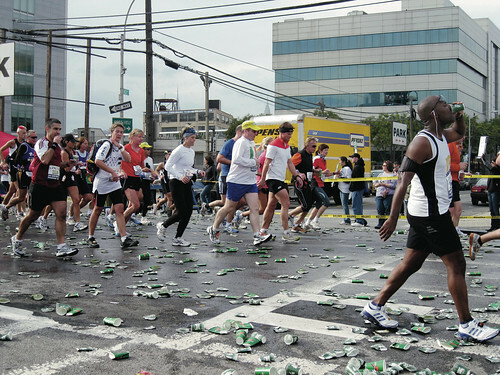 An unidentified 41-year-old man who collapsed at the marathon died on 15 November. The official website for the Marathon is found here. They are currently gearing up for the annual incarnation of the event- scheduled for November 1st, All-Saints Day 2009. The way other cultures will be celebrating the day are ingenious, and varied. Incidentally, Nov 1st is also called Samhain, by some, but I would be surprised at any bonfires lit in the Newtown Pentacle. In Portugal and Spain, ofrendas (offerings) are made on this day. In Spain, the play Don Juan Tenorio is traditionally performed. In Mexico, All Saints coincides with the celebration of “Día de los Inocentes” (Day of the Innocents), the first day of the Day of the Dead(Dia de los Muertos) celebration, honoring deceased children and infants. In Austria, Belgium, France, Hungary, Italy, Malta, Portugal and Spain people bring flowers to the graves of dead relatives. In the Philippines, this day, called “Undas”, “Todos los Santos” (literally “All Saints”), and sometimes “Araw ng mga Namayapa” (approximately “Day of the deceased”) is observed as All Souls’ Day. This day and the one before and one after it is spent visiting the graves of deceased relatives, where prayers and flowers are offered, candles are lit and the graves themselves are cleaned, repaired and repainted. In English-speaking countries, the festival is traditionally celebrated with the hymn “For All the Saints” by William Walsham How. The most familiar tune for this hymn is Sine Nomine by Ralph Vaughan Williams. November 1st is, incidentally, also the anniversary of the abdication of the last Ottoman Sultan in 1922- Mehmed VI, which was the end of a 25 century struggle between east and west that truly began at The Battle of Marathon. It’s also World Vegan Day. For the whole marathon series in a slideshow click here. I was down there shooting between 12 and 2, if you’re one of the runners, contact me for access to full resolution shots. Manhattan just isn’t fun anymore, so I tend to avoid the island of my youthful aspirations and instead spend my time in the boroughs, which are authentic and still very real. However, a dear friend and professional colleague had planned an event in the city, so I crossed the River of Sound and braved a threatening rainstorm. 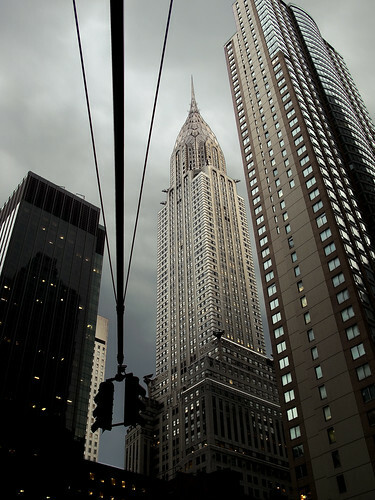 The shot above is from before the rain swept through, shot on the way to the party. 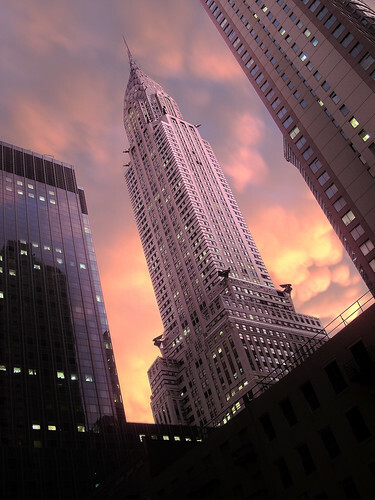 The turbulent skies of New York have supplied its citizens with phantasmagoric light shows at sunset this summer. In late June, while attending the aforementioned social function in the shining Metropolis, a quick glance out a window drew me to the street. Apologizing to my stout hibernian host, whose wife- a wholesome and vivacious descendant of the celtic population of Woodside- was the object and celebrated focus of the catered party, I grabbed my handy camera and ran down to the storm littered streets of midtown Manhattan. Something unique and noteworthy was happening in the skies. 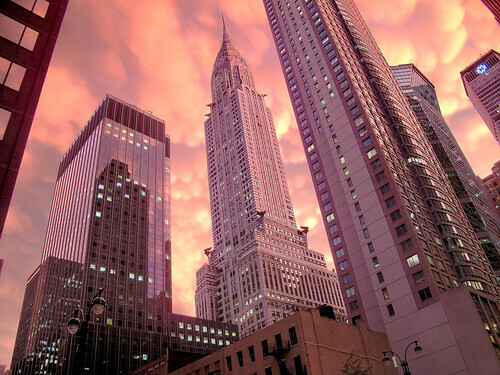 The wake of the rainstorm had promulgated a fairly rare meteorological phenomena called Mammatus clouds. 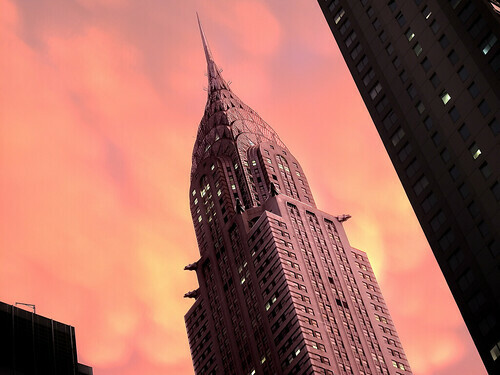 Combined with the westerly underlighting of the petrochemical haze that lends New York City the spectacular sunsets commented on by its citizenry, a remarkable backdrop was provided for the celebrated Chrysler Building. Mammatus, also known as mammatocumulus, meaning “Mammary cloud” or “Breast cloud” is a meteorological term applied to a cellular pattern of pouches hanging underneath the base of a cloud. The name “mammatus” is derived from the Latin mamma (udder or breast), due to the clouds’ characteristic shape, as some believe there is a resemblance between the shape of these clouds and the breast of a woman. There was a lot of buzz about the sky that night. Check out cloudfanatic for other people’s shots of the phenomena. Also, June 26 is the anniversary of the signing of United Nations Charter in 1945, and the Feast day for the Syriac Orthodox Church’s (or Monophysite) Saint, Mar Abhai. Going to be in Newtown on Labor Day weekend? Fun for the Family at the Annual Tugboat Race! A special ride on a tug in the race!!! All proceeds to benefit Working Harbor Committee Maritime Educational Programs for at-risk High School students in the NY/NJ area. I’m going to be helping out at this event, and it promises to be nothing but fun. we scuttled through western Queens – descending from Astoria down to Northern Blvd. we lurked, fearfully, down vestigial 37th avenue – past an anomalous municipal building and fortress church. we marched defiantly into the Sunnyside, and were thunderstruck by the colossus Sunnyside Rail Yard. ruminated on the Boulevard of Death, and gazed upon Aviation High School. 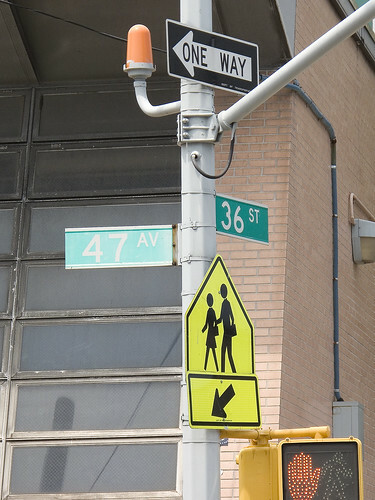 Leaving Aviation High School behind you, Newtownicans, continue up the hill that 36th street transverses. 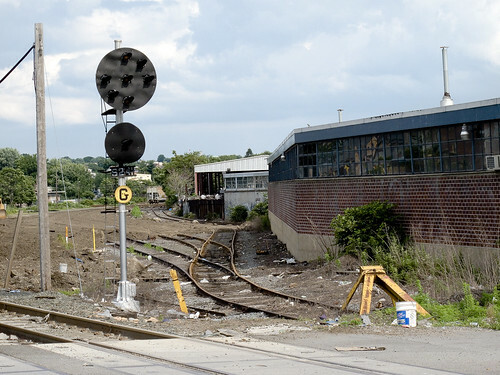 Look to your right, where the western end of 47th avenue is blocked by the Sunnyside Yard – and you will collide with an older post here at the Newtown Pentacle- “Dutch Kills- or let the photos do the walking“. 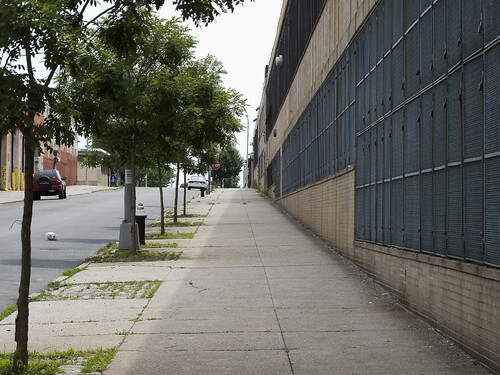 The nearby corner of 47th st. and Van Dam St., which skirts the shadowed valley of that great hill in which Calvary Cemetery is embedded, is where the New York State Queensboro Correctional Facility is located. Just a few blocks beyond the gaol at 29th street is the Dutch Kills tributary of the Newtown Creek. A spectacular riot played out here and in many other New York City Jails in 1970, in response to the poor conditions found in the State and City corrections systems of the 1960’s presaging the Attica riot in upstate New York. This event (and other problems he had in Queens) foreshadowed the jaundiced legacy that Mayor John V. Lindsay‘s political career would be remembered by, and the riots were organized and led by the Black Panther Party and Young Lords. There are many jails here on the Queens side of the Newtown Pentacle, notably Rikers Island, a seething asp caged just off the shoreline of ptolemaic Astoria. The worst jail crisis in the city’s history began at lunchtime four days earlier at the 95-year-old Branch Queens House of Detention for Men. Inmates snatched keys from unarmed guards and made a frantic dash through the halls, unlocking cells all the way. The rioters turned on faucets to flood several floors, set fire to furniture and bedding, heaved debris and an eight-foot wooden bench out of broken cell windows. In a new political twist, they also hung the flag of the black liberation movement from a top-floor window. 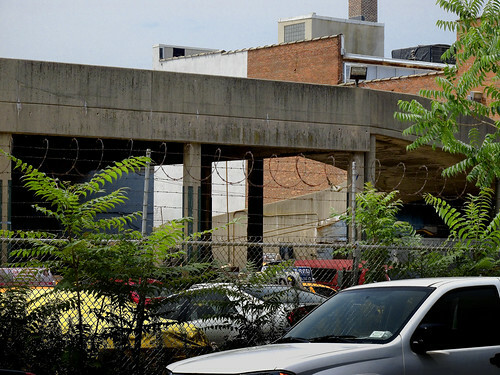 Over the next three days, more riots flared at other city jails, including the Tombs. In all, more than 2,500 inmates joined the rampage and seized 32 hostages—all for the sake of airing their grievances. The proclivity of the ground will take a sharp upturn here, and one becomes increasingly cognizant of the natural lay of the land- with its boulderized hillocks rising from sand and muddy clay- and its formation by the glacial actions of the Wisconsin Ice Age. from geo.hunter.cuny.edu– An intriguing description of the strata found in the New York Bight. Long Island, as part of the Outer Lands region, is formed largely of two spines of glacial moraine, with a large, sandy outwash plain beyond. These moraines consist of gravel and loose rock left behind during the two most recent pulses of Wisconsin glaciation some 21,000 years ago (19,000 BC). The northern moraine, which directly abuts the North Shore of Long Island at points, is known as the Harbor Hill moraine. The more southerly moraine, known as the Ronkonkoma moraine, forms the “backbone” of Long Island; it runs primarily through the very center of Long Island, roughly coinciding with the length of the Long Island Expressway. The glaciers melted and receded to the north, resulting in the difference between the North Shore beaches and the South Shore beaches. The North Shore beaches are rocky from the remaining glacial debris, while the South Shore’s are crisp, clear, outwash sand. Running along the center of the island like a spine is the moraine left by the glaciers. (Bald Hill is the highest point along the moraine.) The glaciers also formed Lake Ronkonkoma, a kettle lake. 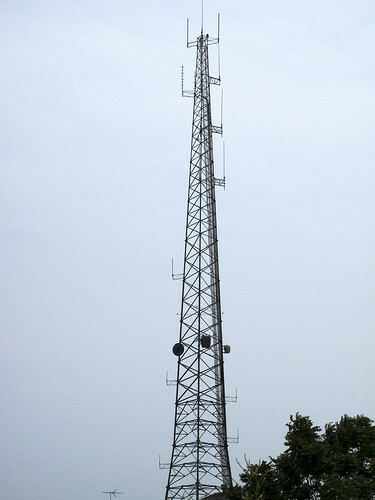 The island’s tallest natural point is Jayne’s Hill near Melville, with an elevation of 400.9 feet (122.2 m) above sea level. Long Island is separated from the mainland by the East River, which is actually not a river, but a tidal strait. Long Island Sound forms the northern boundary of the island. 48th avenue terminates at 30th street, a block from the Dutch Kills. 36th street is about to end too, when we reach the top of the hill. A forbidding stretch of unlettered warehouses describes 48th avenue as it slopes down the morraine carved declination, barren and treeless. Between 48th and Hunters Point Avenue- you will find more warehouses, a very impressive broadcast antennae, and a gigantic charismatic church operating out of an altered workhouse. St. Raphael’s R.C. Church is on Greenpoint Avenue in a neighborhood called (atavistically) Blissville. A wooden frame building was built for St. Raphael’s in 1867, and served as the mortuary chapel for the newly built Calvary Cemetery. 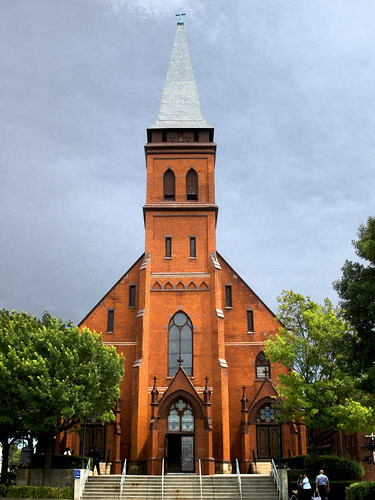 The current gothic influenced structure was completed in 1885, and has served both Calvary and the surrounding community since. This is one of the highest points in these parts, and the church steeple often acts as a reference point when negotiating the byzantine tangle of streets around the Newtown Creek. The architect is rumored to have been Patrick Keeley. Just across the street from the site of the former LIRR Penny Bridge station. Easily accessed via the street, upon crossing the gates of Calvary, one will find a staircase carven into the hill by whose ascent the Newtown acropolis may be obtained. Cresting over the surrounding neighborhoods, and soaring over theNewtown Creek’s former wetlands, Calvary Cemetery keeps its secrets buried in centuried silence. 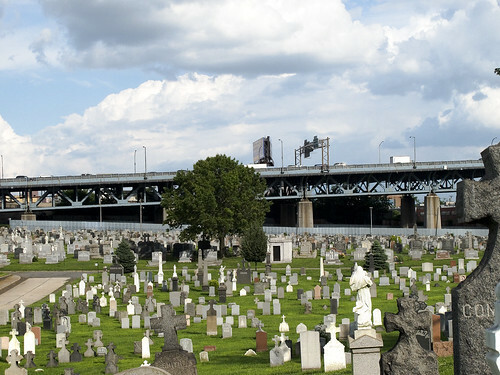 Looking south toward Brooklyn, the Kosciuszko bridge approach of the Brooklyn Queens Expressway looms over its passage, carrying millions of vehicles over and across the necropolis of New York City. Phantoms of what could have been haunt Calvary, roaming in soliloquy amongst the avenues of nitredripping marble. The 1918 superflu and an earlier cholera epidemic staffed the ranks here with both the sacred and the profane. St. Patrick’s in Manhattan used this place for the interment of New York’s best and brightest. This is where the ossified remnants of the men who died battling the traitorous slavers of theConfederate South can be found in the Newtown mud. In subterranean vaults of marble and basalt, and within leaden coffins, these gentlemen– the ultimate product of an age of victorian aspirations- lie in putrid splendor, alongside the occasional merchant and immigrant whose life savings were traded to purchase their final resting place. 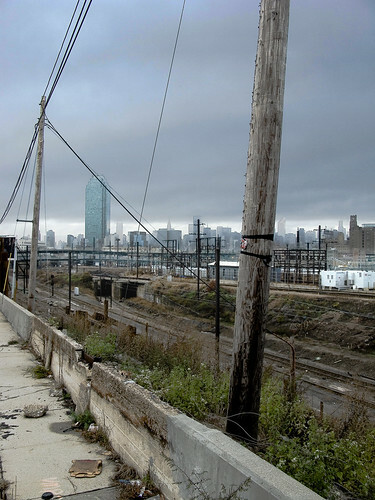 However, we are on the industrial side of town- down by the Newtown Creek- where the sins of our fathers continue to haunt modernity. 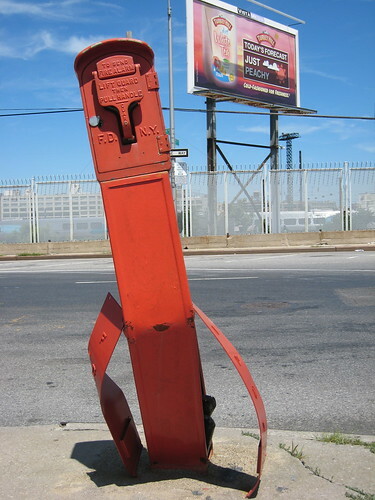 This is where we left off on July 16th- at the corner of 56th road, between 48th and 50th streets in Queens. This is an insanely dangerous patch of road running through a literal industrial backwater, so be careful. Last time we walked down the Maspeth Plank Road toward Brooklyn, today we’re going another way- tracing the course of the Newtown Creek on the Queens side for a while. From the vantage point above, look to your right, and you’ll see the Kosciuszko bridge. Head in that direction, which is roughly northwest and toward Manhattan. 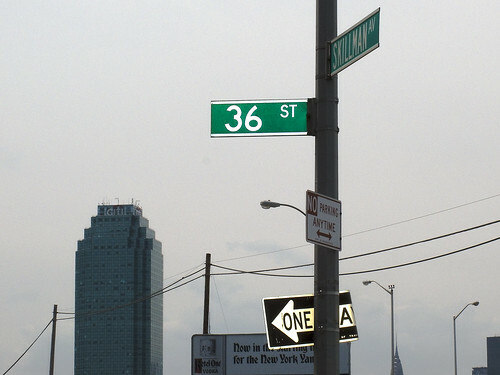 You’ll be walking down 56th rd. for a little while. The sidewalk on the Creek side is fairly non-existent, so cross the street. Watch out for trucks. Why was I here on foot, you ask? In the first installment of this photowalk– we began scuttling through western Queens – descending from Astoria into the milieu of 19th century teutonic progressivism- and found a long forgotten relict of the 1920’s gilded age. In the second, we lurked, fearfully, down vestigial 37th avenue – past anomalous municipal building and fortress church. In the third, we marched defiantly into the Sunnyside, and were thunderstruck by the colossus Sunnyside Rail Yard. Not too far from here (around a half mile east) on Skillman Avenue, during a smallpox epidemic in 1899, the city fathers built a large frame wooden building commonly referred to as “the Pest House”. This is a place of unexpected detail and obscured history, with layers upon layers of significance. I’ve read about the Sunnyside Yard, and observed it from its rotting fenceline, but I’m sorry to say that I cannot grasp the place. Its just so immense, such a huge subject. As in accordance with Newtown Pentacle Policy on such subjects- the history of the FDNY for instance, experts must be referenced and deferred to. In 1899 we had a smallpox epidemic in both Queens and Manhattan boroughs, of which Long Island City had its share of victims. In order to take care of those so afflicted a large frame building was erected in the center of what is now known as Skillman Avenue, a few hundred feet west of Old Bowery Bay Road. In Woodside and on the opposite side of Old Bowery Bay Road, Louis Sussdorf occupied a large mansion. He didn’t like the idea of a wagon (not an ambulance) carrying smallpox patients making the turn opposite his gate on its way to the so-called pest house. 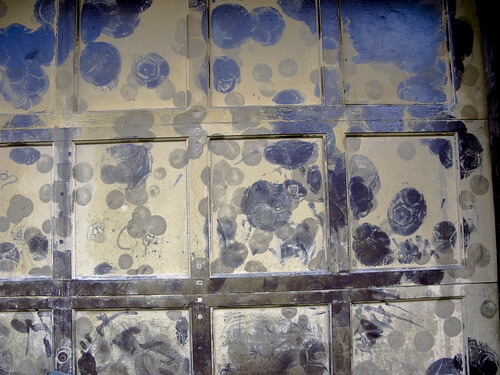 Mr. Sussdorf went to court and tried to obtain removal of the pest house but was unsuccessful. Shortly after the epidemic ceased, Mr. Sussdorf died and as the funeral cortege passed through the gateway on his premises the pest house burst out into flames and was burned to the ground. 99 years ago, Skillman Avenue was still farmland. 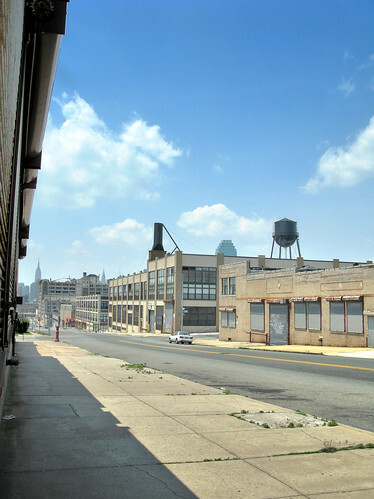 36th street, as one moves in a roughly southern perihelion, displays an industrial neighborhood. On your right will be a fascinating multi-story taxi garage festooned with arcing ramps- reminiscent of a plastic toy service station I played with as an innocent. Its curvilinear shapes and utilitarian use of reinforced concrete suggests mid 20th century design and construction. Curious characters- mohammedans, hindoos, and other representatives of the distant orient mill about- either waiting for a work shift to begin- or just finishing up the hypnagogic 12-16 hours behind the wheel maintained by New York’s fleet of Taxi drivers. Strong coffee and the acrid smell of tobacco hang redolant upon the air, and if one passes at an opportune time- groups of these men can be found kneeling on scraps of carpet as they perform their religious devotions while facing far off Mecca in answer to the call for prayer– heard playing from car stereos. Such adherence to tradition would be remarkable in a an American born Newtownican, and it speaks of a continuity to old world wonders. 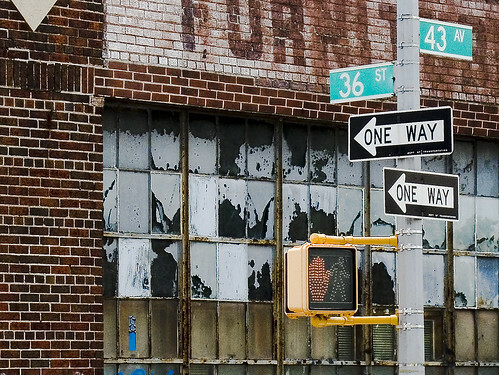 Religion in Long Island City was and is the business of business. 19th and 20th century industrialists with their twin creeds of efficiency and profit built this place. 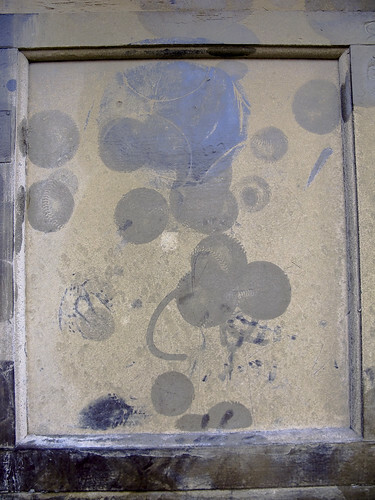 The curious and satisfying esthetics of the area are accidental, a byproduct of utility. A growing but still small number of brave souls decide to live down here in tony condominiums, amongst the effusive whir of city-bound traffic and the hectic and noisome trainyard. For much of the last century, the reverse was true, with vast populations fleeing these neighborhoods for the safety and comforts of Long Island, Westchester, and New Jersey. I’ve coined a phase for the feeling one gets, walking these streets in the off hours when the workers who normally populate the area are enjoying their restful rustications, “a feeling of desolate isolation”. I crave such esoteric intuitions, and the loneliness of wandering a landscape whose very existence is predicated on concentrating large populations into industrial mills and factories. As I’ve mentioned in the past, my headphones are almost always in operation on these long pedestrian ambles, and audiobooks are usually my preferred company. Richard Matheson, Joseph Campbell, and particularly H.P. Lovecraft are often my companions as I walk upon the earth and view the splendors of Newtown. I also bring along a couple of early Black Sabbath albums, and just for kicks- the soundtrack to the Omen movies. Continuing toward the fungus torn ground of Calvary, due south, the grinding noise of the Boulevard of Death penetrates through my headphones. I won’t remind you to safeguard as you cross the massive arterial thoroughfare, for signage attesting to traffic fatalities (and their number) adorns many of its crosswalks- as do tiny roadside shrines memorializing those not loquacious enough to respect the flow of automobiles moving toward the nearby Queensboro bridge. Queens Boulevard is one of those places that New Yorkers just take as a given. 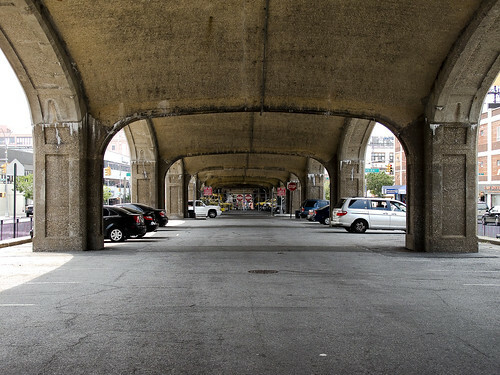 A massive structure which carries elevated subway service from Manhattan, and allows vehicular traffic egress to and from the great city to all points east, Queens Blvd. is properly viewed as an engineering marvel and modern day Appian Way. Queens Boulevard was built in the early 20th century to connect the new Queensboro Bridge to central Queens, thereby offering an easy outlet from Manhattan. It was created by linking and expanding already-existing streets, such as Thomson Avenue and Hoffman Boulevard, stubs of which still exist. 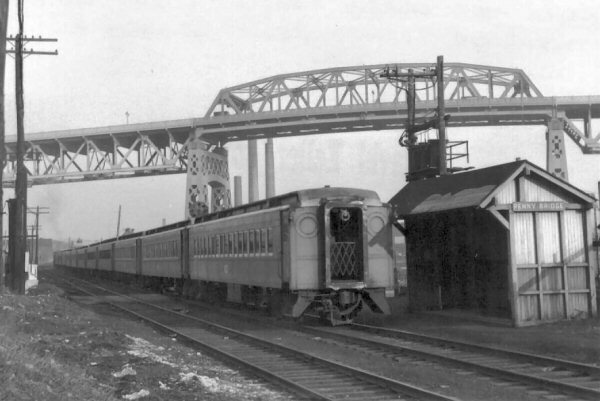 It was widened along with the digging of the IND Queens Boulevard Line subway tunnels in the 1920s and 1930s, and some speculated the plan was to transform it into a freeway, as was done with the Van Wyck Expressway. The city actually did propose converting it in 1941, but with the onset of World War II, the plan was never completed. 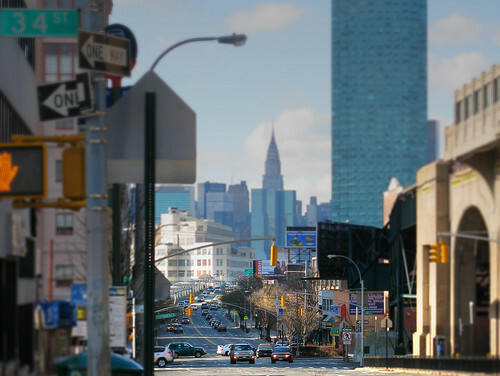 The combination of Queens Boulevard’s immense width, heavy automobile traffic, and thriving commercial scene made it the most dangerous thoroughfare in New York City and earned it citywide notoriety and morbid nicknames such as “The Boulevard of Death” and “The Boulevard of Broken Bones.” From 1993 to 2000, 72 pedestrians were killed trying to cross the street, an average of 10.2 per year, with countless more injuries. 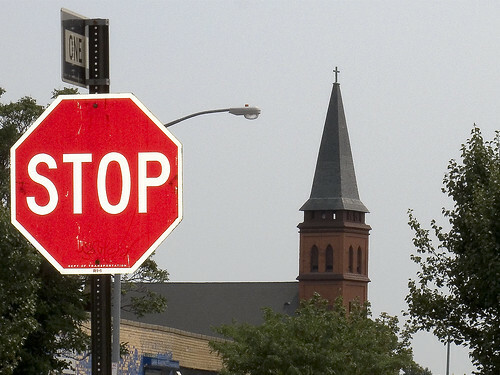 Since 2001, at least partially in response to major news coverage of the danger, the city government has taken measures to cut down on such incidents, including posting large signs proclaiming that “A Pedestrian Was Killed Crossing Here” at intersections where fatal accidents have occurred and installing more road-rule enforcement cameras. I’ve always felt the Roman comparison is apt for this interconnected series of bridges and structures called Queens Blvd., due to the visual impact of the design of the elevated subway tracks- an aqueduct thrusting down the center of the great road, and the manner in which it connects so many disparate communities together as one. 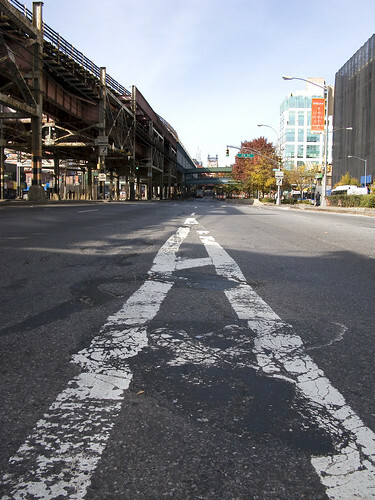 During the 1920’s and 1930’s, New York City began a program to widen Queens Boulevard. 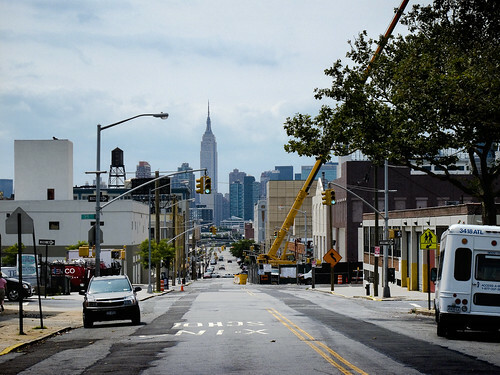 The project, which was conducted in conjunction with the building of the IND Queens Boulevard subway line, widened the boulevard to 12 lanes in some locations, and required a right-of-way of up to 200 feet. Once completed, local and express traffic flows were provided separate carriageways. This highway is the major approach from Queens, Nassau and Suffolk to Manhattan. Its conversion to an express highway could readily be accomplished by the construction of grade separation structures at the more important intersections, and by improved mall treatment to close off access to the express roadways from minor streets. As part of the project, the express lanes of Queens Boulevard were depressed in the area of Woodhaven Boulevard and Horace Harding Boulevard (later developed as the Long Island Expressway), while the local lanes were kept at grade level. However, the plan to upgrade Queens Boulevard to an expressway was delayed by the onset of World War II, and ultimately, was never implemented. In the postwar era, Robert Moses, the arterial coordinator for New York City, shifted attention to creating an express route between the Queens-Midtown Tunnel (now under the jurisdiction of his Triborough Bridge and Tunnel Authority), Queens and Long Island. First proposed as improvements to the Queens-Midtown Highway and Horace Harding Boulevard, the route evolved as the Long Island Expressway (I-495). According to the New York State Department of Transportation (NYSDOT), Queens Boulevard now carries approximately 50,000 vehicles per day (AADT). In recent years, speeding motorists who exceed the 30 MPH speed limit and jaywalkers have created a lethal mix along densely populated stretches, prompting officials to enact tough measures against both offending groups. A major commercial strip as well as a transportation artery, one observes all sorts of colorful chicanery and the craft of advertising at its basest operating along the strip. 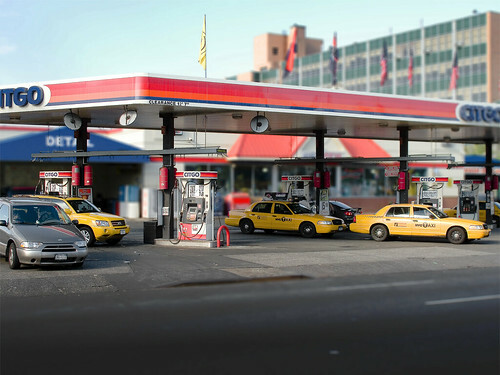 Many restaurants, gas stations, and bodegas operate along Queens Blvd. I would suggest a stop for supplies, as we’re about to head into another barren industrial moonscape. 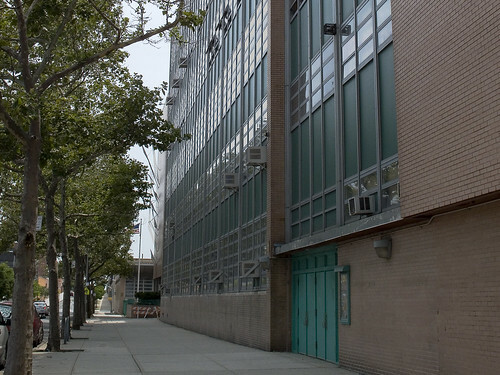 On Queens Blvd.’s southern shore you will observe Aviation High School (this is the 36th street side). I highly suggest that you detour onto 35th street at this point. Before the second world war, New York City had two classes of secondary education available. School administrators would determine, based on performance in primary school and all too often ethnicity, if one would continue on a scholastic or vocational tract. These often arbitrary and prejudiced reckonings would determine future social class and professional options, damning otherwise sound minds to a lifetime of labor based on an assumption of stereotypical ethnic predestination (the irish cop, black laborer, jewish lawyer, the white doctor, and the female nurse). The “identity politics charismatic leaders” of the 1950’s and 60’s pointed out the unfairness of this policy and the racial and class stratification it enforced, and the vocational schools joined in the current curricula during the mayorality of John Lindsay. Aviation is a holdout from that era, although it is now listed as “specialized“. Our state-endorsed Career and Technical Education program provides students with a world-class education. This unique curriculum prepares students for a New York State Regents Diploma and Federal Aviation Administration (FAA) certification as Aircraft Maintenance Technicians, leading to exciting and lucrative careers in the aerospace industry. Inherent in this, we create an educational culture that instills respect, self-discipline and strong intellectual values in meeting the demands of today’s colleges and universities. Our world-renowned reputation for academic and technical excellence reflects Aviation High School’s tradition, mission and commitment to its students, their future and the future of the aerospace industry. 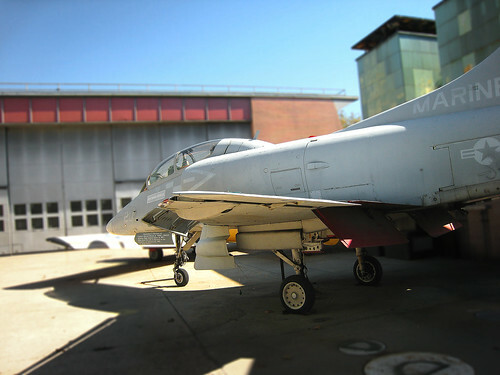 The United States military has been very generous to the students at Aviation High School, and the shop yard found on 35th street houses a few things that you don’t expect to find along Queens Blvd. That’s a plane I can’t positively identify- but I think it may be some iteration of the WW2 Japanese Zero. The Revell scale model airplane kits I was obsessed with building and painting in my adolescent years have taught me nothing. Knowledge anyone? 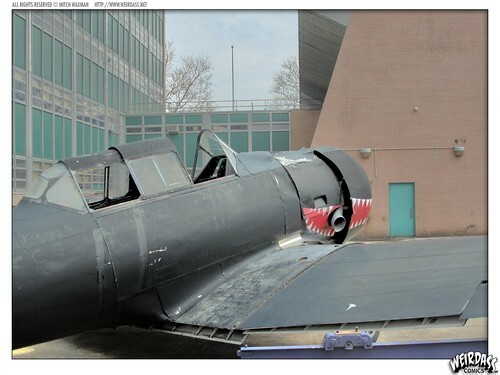 …the sharktoothed plane you can’t positively identify is not a Mitsubishi Zero. It’s a North American T-6 Texan, an advanced training aircraft used by the U.S. military during World War II. You’re not completely off base with your Zero comparisons, though. Know the old movie about Pearl Harbor, “Tora Tora Tora”? All the Zeros in that film are actually modified T-6 Texans, which could be bought as surplus for ludicrously cheap prices when the war ended. Real Zeros are as rare as hens’ teeth, since most of them were either shot down, left to rot on abandoned airstrips or scrapped in Japan. This plane, a United States Marines Corps Harrier- donated by the Corps itself- is dedicated in the name of Capt. Manuel Rivera, Jr. – the first American casualty during 1992’s Operation Desert Storm. Capt. Rivera was an alumni of Aviation High School. The jet aircraft is a Douglas TA-4 Skyhawk, the trainer version of a Vietnam-era attack plane. 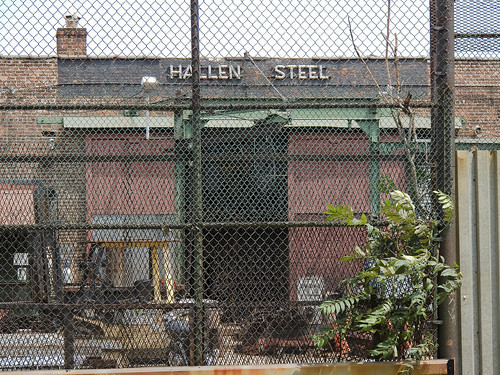 Hallen Steel is directly across the street from Aviation. This is their website, they seem to be some sort of metal working facility. I just really like the way their front yard looks. They are very prepared for what we here at Newtown Pentacle refer to as a “night of the living dead type situation”. Given my druthers, there’s a scrap yard I know in Greenpoint that would make a better shelter against the massive infestation of flesheaters that New York would surely produce, but Hallen is closer. I also like the guard towers on the George Washington Bridge for similar duty. We are crossed by “the cemetery belt”, after all. What, you never thought that one through- zombies in New York? I once did a 64 page BW comic about it, called Deadworld:Necropolis. In addition to being “the night of the Living Dead“, August 23rd is also Vulcanalia. Vulcan’s oldest shrine in Rome, called the “Volcanal”, was situated at the foot of the Capitoline in the Forum Romanum, and was reputed to date to the archaic period of the kings of Rome, and to have been established on the site by Titus Tatius, the Sabine co-king, with a traditional date in the eighth century BC. It was the view of the Etruscan haruspices that a temple of Vulcan should be located outside the city, and the Volcanal may originally have been on or outside the city limits before they expanded to include the Capitoline Hill. The Volcanalia sacrifice was offered here to Vulcan, on August 23. Vulcan also had a temple on the Campus Martius, which was in existence by 214 BC. The Romans identified Vulcan with the Greek smith-god Hephaestus, and he became associated like his Greek counterpart with the constructive use of fire in metalworking. A fragment of a Greek pot showing Hephaestus found at the Volcanal has been dated to the 6th century BC, suggesting that the two gods were already associated at this date. However, Vulcan had a stronger association than Hephaestus with fire’s destructive capacity, and a major concern of his worshippers was to encourage the god to avert harmful fires. His festival, the Vulcanalia, was celebrated on August 23 each year, when the summer heat placed crops and granaries most at risk of burning. During the festival bonfires were created in honour of the god, into which live fish or small animals were thrown as a sacrifice, to be consumed in the place of humans. Vulcan was among the gods placated after the Great Fire of Rome in AD 64. In response to the same fire, Domitian (emperor 81–96) established a new altar to Vulcan on the Quirinal Hill. At the same time a red bull-calf and red boar were added to the sacrifices made on the Vulcanalia, at least in that region of the city. August 23rd is also Mitch’s Birthday, look for him down on Newtown Creek today, or perhaps Calvary. He’ll be the one throwing small fish into a fire.